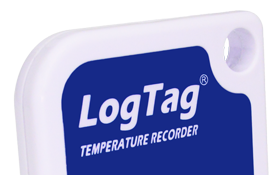 Once your LogTag is configured and you have worked out where you want to put it, the next step is to start the LogTag so it can begin collecting data. If you selected Push Button Start in your LogTag configuration, the logger will now be waiting for you to start it. Press and hold the Start button for about a second. Both the red and green LEDs on the front of the logger will flash for a few seconds to show that the logger is starting. After that, the green OK LED will flash briefly about every 8 seconds to show you that the logger is recording.